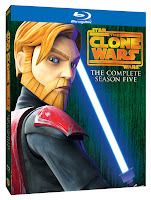 The Daytime Emmy winning Star Wars: The Clone Wars Season 5 is coming to DVD and Blu-Ray on Oct 15, 2013, and a Seasons 1 through 5 box set is also set for release; however, neither of these will feature the much talked about "bonus content." RebelForce Radio reported this information earlier this week on their Facebook page, once again proving the reliability of their inside sources. After the Secrets of the Clone Wars panel at Star Wars Celebration Europe II, the Star Wars.com and the Star Wars YouTube channel released Star Wars: The Clone Wars Season 5 Blu-ray and DVD Trailer, embedded below. Star Wars Underworld, in their coverage of Star Wars Celebration Europe II, live tweeted the Secrets of the Clone Wars panel featuring Dave Filoni and Pablo Hidalgo. Their coverage featured a several important updates including the following tweets from @TheSWU.